Hardcover, 9.25 x 12 in. / 112 pgs / 59 color / 6 duotone. Text by Hans Ulrich Obrist, Mónica de la Torre, Kyung An. 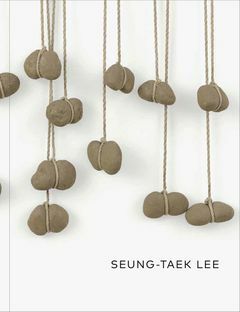 At once emphatically abstract and culturally specific, the work of Seung-taek Lee (born 1932) draws on the subtle beauty of Korean aesthetic traditions and folk art, also reflecting contemporaneous developments in earth art, Mono-ha and postminimalism—while maintaining resolute independence from its peer groups. Lee's oeuvre spans painting, drawing, sculpture, installation and performance, often within the same piece. Notions of negation—which he alternately refers to as “dematerialization,” “anti-concept,” and “non-sculpture”—structure his approach, by which he transforms ordinary objects, imbuing them with multiple meanings and affects. Embracing invisible forces and unorthodox materials such as tree branches, wire, stones, human hair, fabric and rope, his art elevates the mundane to the level of myth. This is the first English-language overview of his work. FORMAT: Hbk, 9.25 x 12 in. / 112 pgs / 59 color / 6 duotone.